A stroke can come as a shock and may feel like an unforgiving, arbitrary attack on your health and well-being. But a stroke is not completely random. There are certain factors that have been proven to increase stroke risk. They can, however, be detected and managed to substantially reduce your chance of stroke. A transient ischemic attack (TIA) is a reversible stroke, often referred to as a mini-stroke. Most people who experience a TIA go on to experience a stroke if the underlying risk factors are left untreated.​ A TIA is the most predictive stroke risk factor and is a warning sign that you need to get a thorough health evaluation. Typically, a TIA occurs due to one or more of the same risk factors that cause a stroke. If you have family members who have had a stroke, you may be at an increased risk due to similar lifestyle habits or hereditary factors. Be sure to tell your doctor if you have a family history of stroke as that will guide the medical tests that he/she orders for you. Diabetes causes disease of the inner lining of the blood vessels throughout the body, including the heart and brain. This increases cerebrovascular disease which can lead to a stroke. Pre-diabetes and diabetes are both conditions that can be managed with diet and exercise to reduce health consequences. High blood pressure, or hypertension, causes a slowly progressive disease of blood vessels throughout the body, including the heart, the brain, and the carotid arteries. The diseased blood vessels are likely to form clots or trap clots traveling throughout the body, leading to ischemic strokes. Hypertension can also contribute to the rupture of defective, abnormally shaped blood vessels, causing hemorrhagic strokes. Stay informed on the updated guidelines for blood pressure management to make sure you are meeting appropriate blood pressure targets and ranges. High cholesterol, like hypertension and diabetes, can damage the arteries of the heart, carotid arteries, and brain. 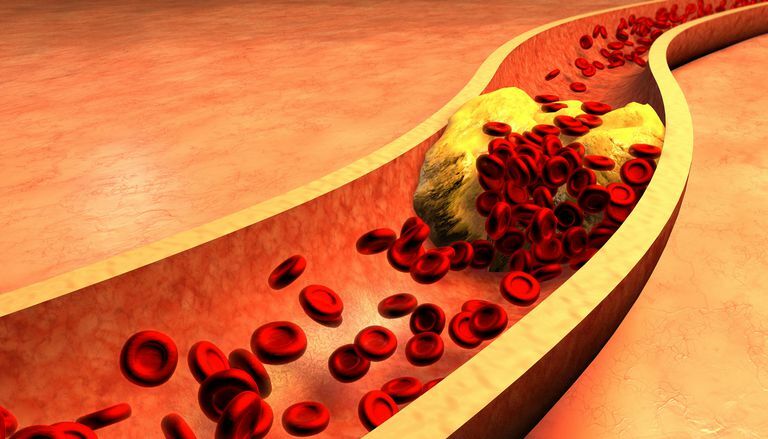 Cholesterol has a tendency to build up and cause stickiness within the blood vessels. This increases the chance of a blood clot getting lodged in a blood vessel and interrupting blood supply to the brain. Cerebrovascular disease is a condition in which the blood vessels that deliver blood to the brain are damaged, narrow, or irregular. This can potentially lead to a stroke if left untreated. Coronary artery disease (CAD) is when blood vessels of the heart become damaged. CAD may lead to heart attacks which can result in a sudden lack of blood supply to the brain. After recovery from a heart attack, some people experience an irregular heartbeat or heart failure. An irregular heart beat, or arrhythmia, can contribute to the formation of blood clots. These blood clots may travel to the brain and get trapped in small blood vessels, resulting in ischemic stroke. Often, blood thinners are recommended to reduce the risk of stroke related to an irregular heart beat. And, recently, new at-home tools have emerged which make it easier to detect the frequency of heart rhythm irregularities throughout the day. After a heart attack or as a result of excess strain on the heart, the heart muscle becomes weakened, making it difficult to pump blood efficiently. Valve disease can be congenital (present at birth) or it may develop later in life. It may also cause changes in the blood flow throughout the body, increasing the risk of blood clot formation and potentially leading to ischemic stroke. The blood vessels in the neck are carotid arteries. If they are narrow or irregular, they can form blood clots that may travel to and lodge in the blood vessels of the brain. There are a number of interventional procedures that can repair the carotid arteries. Heart defects that are present at birth can cause a wide variety of problems, including stroke. Heart defects can include misplaced blood vessels, leaking of blood from one region of the heart to another, and other anatomical problems. Most heart defects can be detected and safely repaired at a very young age. Inflammation and infection of the heart are uncommon, but they can cause blood clots, heart failure, heart attack, and further infection or inflammation that may affect the brain. Bleeding disorders are a group of diseases that have the inability to form a proper blood clot in common. This leads to excessive and prolonged bleeding in any part of the body, including the brain, after any type of injury. The bleeding can also occur spontaneously. When blood clotting is abnormal, it can predispose the formation of blood clots. In turn, blood clots form in the blood vessels and travel and lodge in the brain or elsewhere in the body. Sickle cell anemia is a genetic disorder of the red blood cells. Those abnormal cells are rigid and can stick to the walls of the cerebral blood vessels causing a stroke. For some women, pregnancy can increase the risk of blood clotting. There is a mildly increased risk of stroke during pregnancy. It is typically associated with an underlying blood clotting disorder or an inflammatory condition. Some autoimmune disorders can increase the risk of stroke by predisposing you to the development of blood vessel disease or the formation of blood clots. If you have been diagnosed with an autoimmune disease such as lupus, psoriasis or alopecia areata, there is a mildly increased risk of stroke and other blood clotting events. Infections can predispose the formation of blood clots, dehydration, or heart failure. The link between infections and stroke is believed to be related to an increase in inflammation that can make a stroke more likely. In fact, even poor dental health, which causes mild oral infections, is linked to stroke. A brain aneurysm is an abnormally shaped blood vessel with an outpunching, usually present from birth. It may rupture as a result of extreme blood pressure fluctuation or severe illness. If you have been diagnosed with a brain aneurysm, you may or may not be a candidate for aneurysm repair, depending on the location of your aneurysm and your overall health. Find out more about brain aneurysm prognosis. Obesity has been shown to be a risk factor for stroke. While it is known that high cholesterol, hypertension, and diabetes—which all contribute to stroke—are associated with obesity, research shows that obesity is an independent stroke risk factor. This means that obese people are more likely to have a stroke when compared to non-obese individuals who have comparable blood pressure, cholesterol, blood sugar. Lack of regular physical activity can increase obesity, high cholesterol, hypertension, and heart conditions. Arteriovenous malformation (AVM) is a blood vessel abnormality that, when ruptured, causes a hemorrhagic stroke. Sometimes, AVMs can also cause neurologic deficits by “stealing” blood flow from the surrounding brain tissue. HIV and AIDs can increase the risk of infection, inflammation, and cancer—all of which raise your stroke risk. There has been an observed increase in the incidence of stroke among people with HIV and AIDS. Oral contraceptives can slightly increase the chance of blood clot formation. The risk is more prevalent among smokers who use oral contraceptives. Stress is the emotion most significantly associated with an increased stroke risk due to its effect on blood flow, blood pressure, and hormones throughout the body. However, mood fluctuations, including depression and anxiety, are also associated with stroke. Cigarette smoking causes severe damage to the inner lining of the blood vessels throughout the body. Smoking is one of the most damaging controllable risk factors for stroke. Yet, the most surprising fact is that the damage incurred to the body through smoking gradually reverses if exposure to smoking is discontinued. A variety of recreational drugs can produce physiological changes in the body that lead to stroke. Cocaine and methamphetamine are both highly addictive substances that lead to stroke. 'Blood doping' is a highly controversial and illegal method that some athletes use to gain an unfair advantage over competitors; the illegal use of erythropoietin can also increase the risk of stroke. While hormonal replacement therapy, particularly testosterone and estrogen, are often necessary to maintain a desirable quality of life, they are not without risk. Hormonal substitutes have been associated with an increased stroke risk. However, there is conflicting data among a few studies showing no or decreased risk. Cancer can increase the chance of stroke and can also increase the risk of infection, inflammation, and blood clotting problems—all factors that can lead to a stroke. Most risk factors build disease gradually over time before a sudden stroke happens. And most of them contribute to each other. But some of these risk factors are manageable, controllable, or modifiable. So identifying them goes a long way in preventing stroke. Kim K, Lee JH., Risk factors and biomarkers of ischemic stroke in cancer patients, Journal of Stroke, May 2014. Llibre-Guerra JC, Valhuerdi Cepero A, Fernández Concepción O, Llibre-Guerra JJ, Gutiérrez RF, Llibre-Rodriguez JJ, Stroke incidence and risk factors in Havana and Matanzas, Cuba, Neuralgia, June 2014 (Diabetes, HTN, Smoking). Stroke incidence and association with risk factors in women: a 32-year follow-up of the Prospective Population Study of Women in Gothenburg, Blomstrand A, Blomstrand C, Ariai N, Bengtsson C, Björkelund C, British Medical Journal, October 2014. Is Low Vitamin B12 a Hidden Cause of Stroke? How Does PTSD Increase the Risk of Stroke? Can a Vegetarian Diet Prevent Stroke?